This used to be the Dairy Queen. Long-term readers (hello by the way!) may remember that I drew this before, back in its DQ glory days. As you can see, it looks a little different now. A couple of years ago, the DQ finally closed its doors and sold its last chicken strip, but rather than lose the building entirely for something new, glassy and nondescript, an architecture firm called Indigo took over the space and did something creative with that very distinctive wavy roof, creating a modern but unintrusive structure. 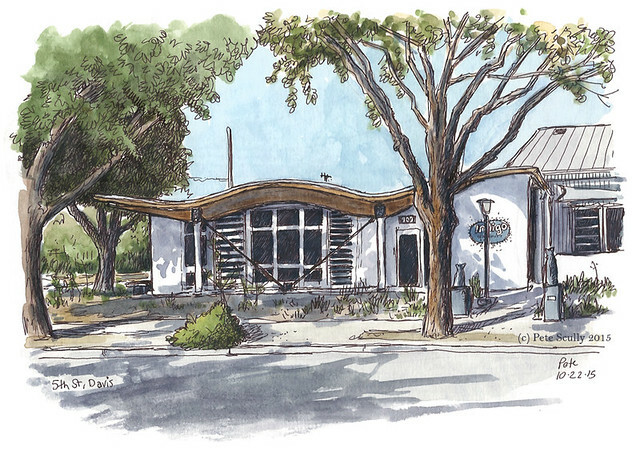 They have described it as a “Bioregional Building”, which sounds like they’re taking a word, remodeling the word, keeping the word’s roof and making a new, modern eco-friendly word (in other words yes, I don’t know what “bioregional” means). Indigo (Hammond and Playle) explain their process for rebuilding the old Dairy Queen into a modern energy-efficient and “climate-adapted”office space on their website. As well as this award-winning structure they have also created an adjoining space which, “clad in corrugated metal alludes to the agricultural vernacular of California’s Central Valley”. It all does look very nice. Not however as strikingly red as its predecessor, but surely a lot healthier. Here are my previous sketches of the Dairy Queen, the first from 2011, the second from 2013. I actually sold both of these drawings, the first was part of my 2011 solo exhibition at the Pence Gallery. I learned that the Dairy Queen in Davis was very popular, despite it never appearing to be that busy. There was something all-American about Dairy Queen (I mean ‘is’, because it still exists elsewhere). 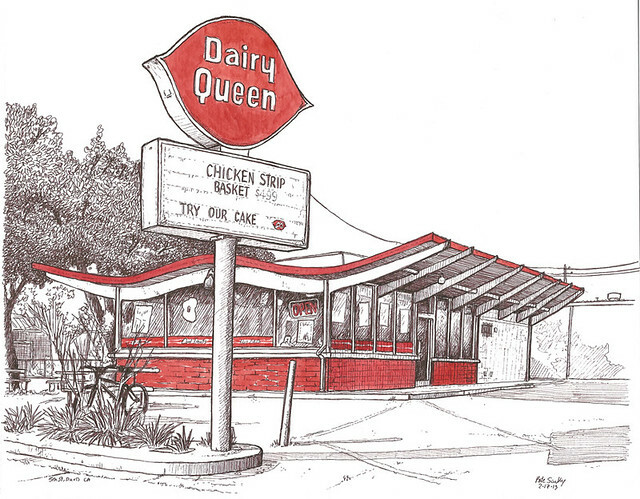 When I was asked years ago to sketch something ‘American’ for an old university friend in the UK who had an American husband who missed the USA, I chose to sketch the Dairy Queen. 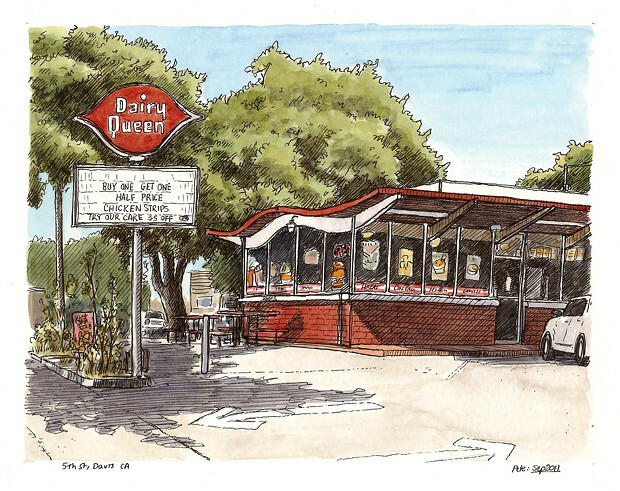 The one in Davis was beloved as a place to take the grandkids for a treat (people who have grandkids have told me), and my wife used to stop off here for an ice-cream on the way to picking up my son from pre-school. Alas, Davis Dairy Queen is no more, but we still have its roof. 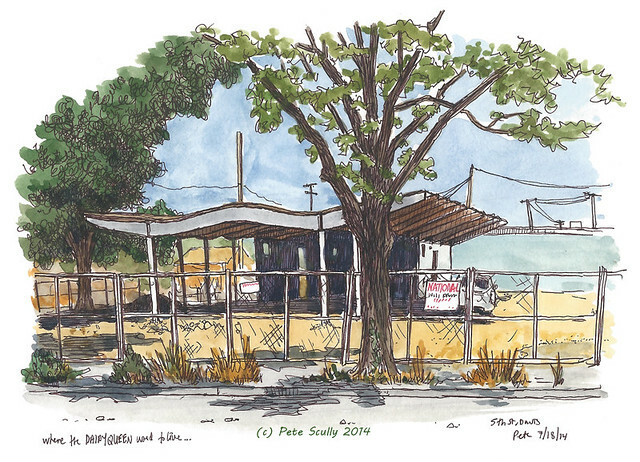 Your sketches are preserving local history and charting its changes. Your sketches is cool. Salute.